Brass Terminal Bars is the house of quality “brass products”. 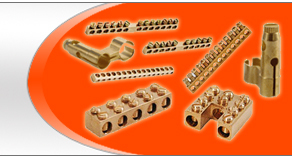 We manufacture brass terminals used for electrical connections in various parts. We are engaged in supplying wide array of products ranging from Brass Inserts, Electrical Accessories, Brass Anchors, Brass Auto Parts and many more. Beside our quality, we are known for our professionalism, timely deliveries, etc. potentials which have helped us in cumulative growth rate since last decade. At Shiv Om Brass Industries, we rely on search for excellence is a continuous process and our achievements are purely milestones in the long journey. Our Brass Manufacturing Terminals has achieved the height of success and strength by Recycling, Machining, Forging and providing customized Fabrication solutions to our customers. Our highly expert professionals put their enormous efforts to attain the higher level of client’s satisfaction. Our well established infrastructure setup is located in Jamnagar, Gujarat. The quality perception starts from checking and maintaining of raw material at every manufacturing stage to final inspection of brass components for dispatch. These Brass Components and Terminal Bars are supplied to the esteemed clients at rock bottom prices. Contact us today for Brass Parts, Brass Terminal Bars, India. To meet small as well as bulk orders, we are looking forward for inquiries related to brass parts and components are greeted from different countries like Japan, Iran, Australia, South Africa, Italy, Thailand, Asia, Germany, Iraq, Sweden and many more.